American English Pronunciation: American English Pronunciation: T or D? 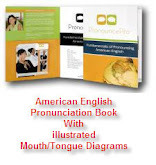 Article to help English Speaking and English Pronunciation by PronouncePro American English Pronunciation Writing Staff. Non-English speakers are often puzzled by the American English pronunciation of the letter ’t’. Sometimes it sounds clearly like a /t/ in the word determine), but other times it sounds almost like a /d/. There are a lot of technical descriptions of this phenomenon, and linguists, phoneticians and language teachers can have lively conversations and debates about how best to describe it. For most learners, however, it helps to know a few simple facts about what happens to the /t/ sound in American English pronunciation. Let's take a look at two words which sound almost alike when spoken by an American speaker of English. Ladder is an object used for climbing, and latter is used to refer to the second of two previously mentioned items. There spelling and meanings are different, but in American English pronunciation, the two words sound the same. What is happening here? First, it's important to understand the stress patterns in the words. Both words are stressed on the first syllable. In American English pronunciation, when a stressed syllable occurs before the letter 't', the /t/ sound is pronounced with a sound similar to a /d/. This happens only when the stressed vowel is followed directly by the ’t’. If a consonant comes between the vowel and the 't', the 't' keeps its regular pronunciation. For example, in the word "lasting", the first syllable is stressed, but there is an 's' between the stressed vowel and the 't', so you clearly hear the /t/ sound. There are other ways in which the 't' can be pronounced differently in American English pronunciation. But for now, see how many examples of the /d/ phenomenon you can hear in the English around you. About Author: Mary Gillespie, ESL Teacher and Owner of the Online ESL Tutoring Service, www.AtHomewithEnglish.com.